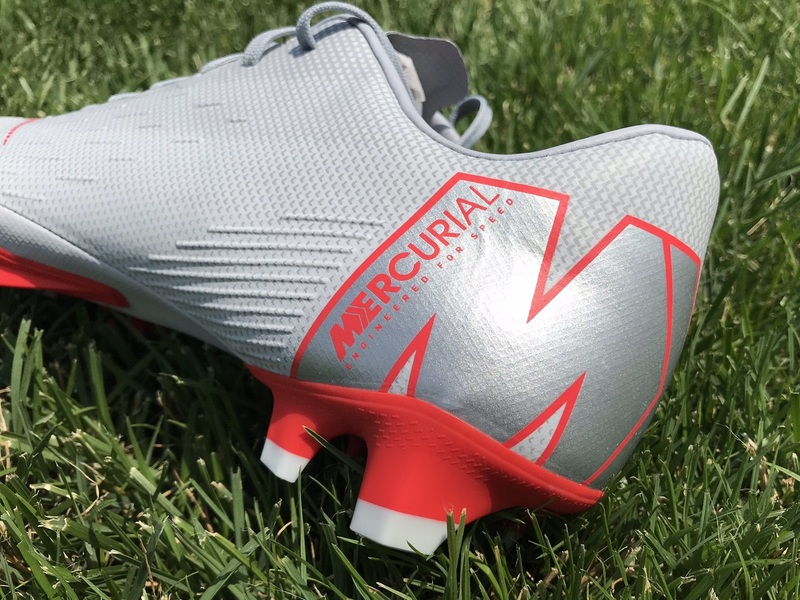 When it comes to mid-tier boots that pack some extreme attitude, the Mercurial Vapor XII Pro sits right at the top of the list. It can be extremely difficult to fork out $200 on a new pair every few months, so finding value for money options can be vitally important. Researching more economically priced options might have brought you to this review. 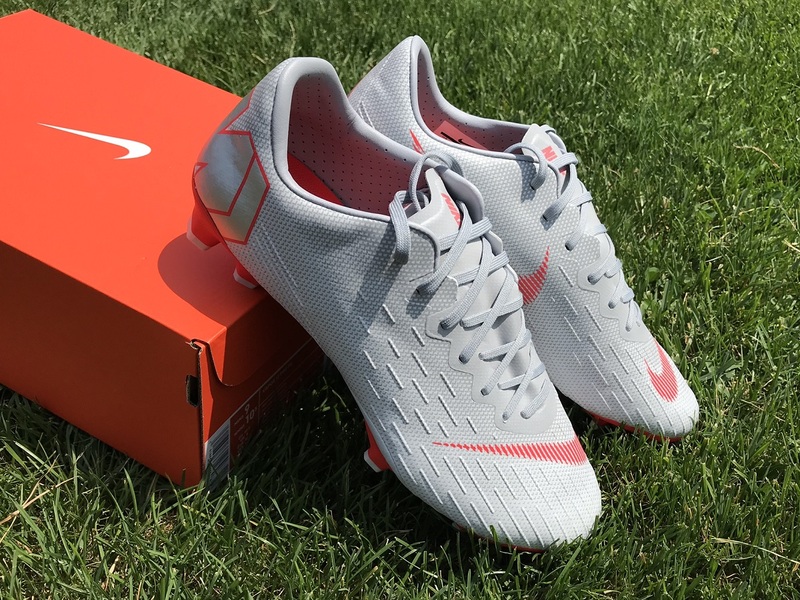 Rest assured, Nike hasn’t forgotten about the player on a budget, and they have crafted a very effective shoe in the Vapor Pro series. So, what exactly can you expect from this 2018 edition of the Vapor Pro? And, do they live up to their reputation? I’ve been testing these for several weeks in games and training sessions, and even though they have their own unique sizing issues (more on that below), they still have a lot of positives to offer. You can find all currently available Vapor Pro colorways at soccer.com. 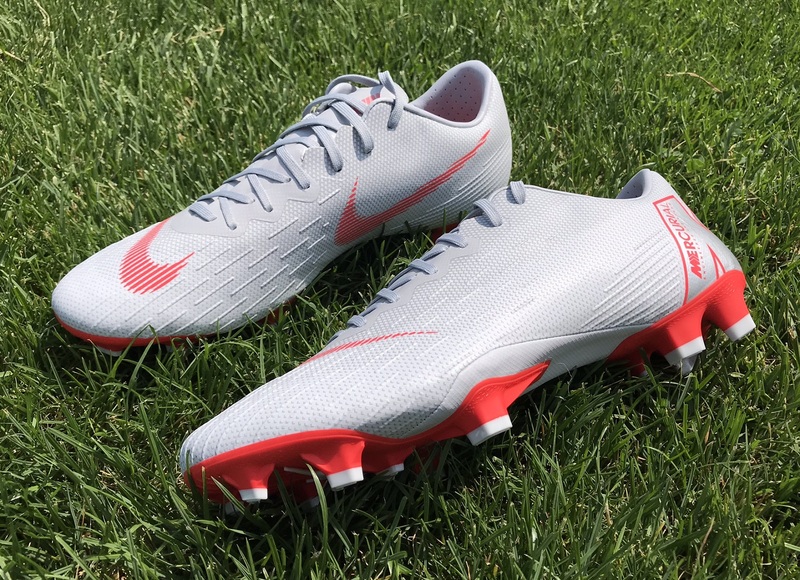 There are definite similarities between the Vapor Pro and Vapor Elite that makes them a very appealing option for players. I can see why they are deemed to be one of the top-selling mid-tier boots on the market. 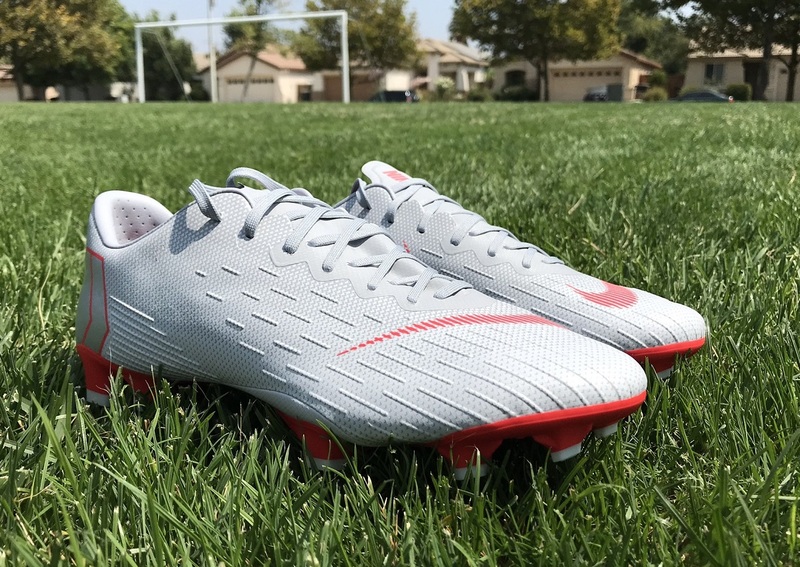 Everything about the design is streamlined and built for speed, with the added texture through the upper enhancing touch and control on the ball. If it says it on the boot, it must be true! 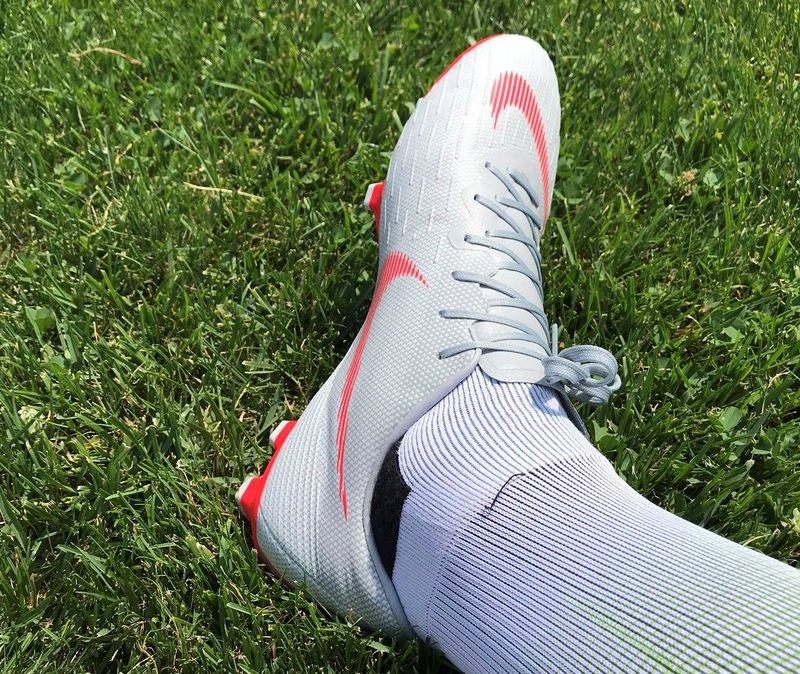 Just like the Vapor Elite, the Vapor Pro is “engineered for speed”, only in a slightly more toned down fashion. At 7.2oz, they fall comfortably into the lightweight boot category and will give you twinkle toes in play. Personally, I just love the shape of the boot as it looks so aerodynamic, with a forefoot design that arrows down towards the toes. 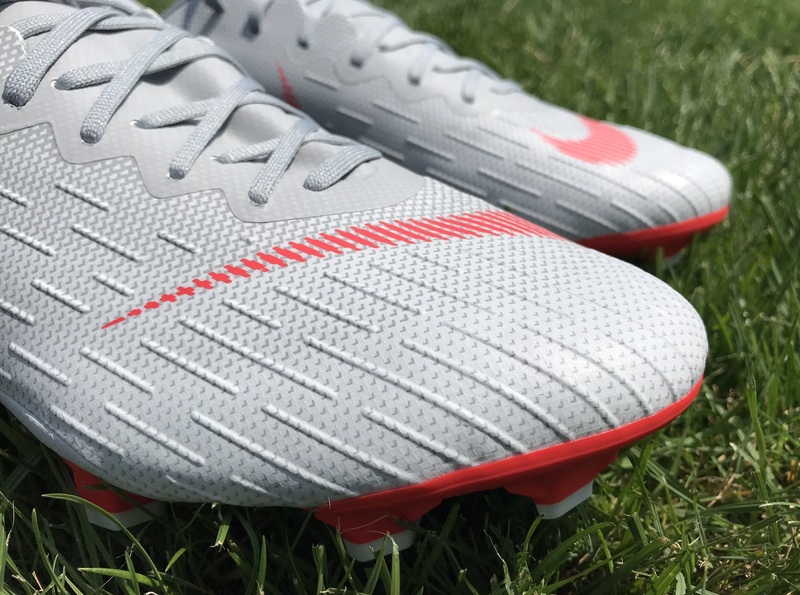 Nike use a decently strong synthetic upper across the top of the Vapor Pro. In terms of material feel, you are always looking for something that is a little more pliable and more responsive on foot. I would label the synthetic here as being more of the opposite, with a rigid, not very flexible feel as you roll your fingers across it. Normally, this would be a negative, but here is an instance where it actually isn’t. Well, not completely. One of the benefits to the more rigid feel is the fact the boot keeps it shape across your foot, and that follows the logic of the narrow, snug fit of the upper. So, you are getting something that offers consistency and doesn’t affect durability. In fact, these are incredible durable to wear and I can see players easily getting a seasons play from their pair. On the opposite side of the spectrum, you do lose that natural touch on the ball that attacking players anticipate having from their speed boot. Don’t get me wrong here, it is not like the material inhibits any feel on the ball. In fact, they still provide a more responsive level of feel that some other category boots. But they don’t give you that thin as-one Vapor Elite level of touch. When it comes to control, the addition of some lined texturing helps in play. This is especially true in slick or wet conditions when you need something to enhance grip for a better touch. You can see it quite clearly in the below images. It is more pronounced on the Vapor Pro, and kind of looks a little tacky in person. So, the one visually significantly different part of this boot compared to the elite version is the soleplate. You still get the split plate design and the chevron blades, but you don’t get the incredible Chrome finish that adds an extra level. Still, the implementation is very similar and designed to enhance acceleration and quick changes of direction. In play, it works out really well. I used these on both FG and artificial surfaces with positive results. Each chevron blade is strategically positioned and angled to enhance the boots release and push-off from the ground. 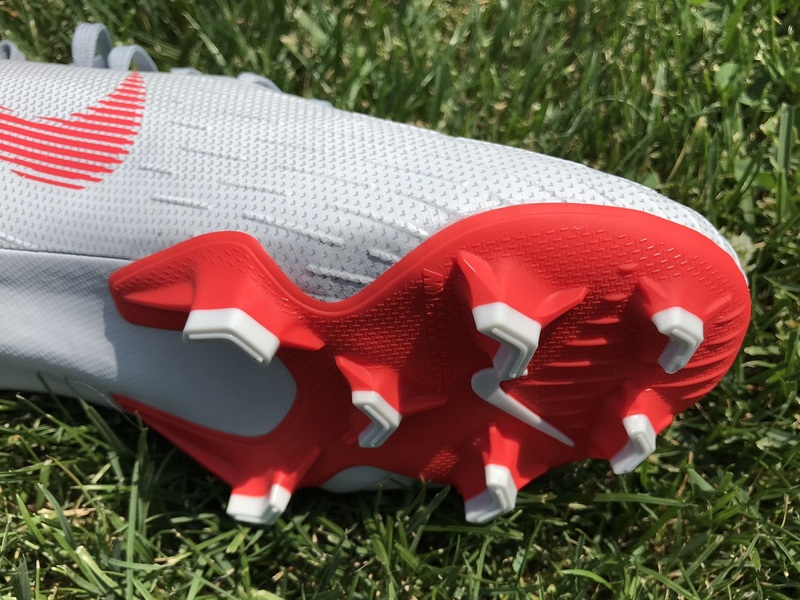 In order to enhance the shape of the boot, Nike has included a closed tongue design. This ensures the boot sits snug right across the midfoot. You can loosen the laces right up, with a tongue separating about one-quarter of the way down, but after that it produces a locked down feel on foot. This is a Nike Mercurial Vapor release, so as you would expect they fit pretty snug. Everything Vapor is designed to hug your fit and provide an aerodynamic fit. For those of you who have tried and failed to properly adjust to the fit of a Mercurial release before, I wouldn’t immediately be discouraged. I have a medium/wide fitting foot and was able to squeeze into them. The key is opening the laces completely up first. Once tightened, the upper actually has a slightly wider forefoot than I’ve found on previous Mercurial releases. But they material doesn’t provide any stretch, so what the fit you get out of the box is what you should expect. To that extent, if they are too tight from day 1, don’t wear them. The one area where I found them to be pretty tight was along the big toe socket. It wasn’t enough for me not to wear them, but for a player slightly wider it might prove problematic. I have to say that they absolutely are. When you consider what you are getting for their very reasonable $119.99 price point, you can’t really go wrong. I’d label them as being one of those boots that sneaks up and surprises you, giving you the impression they are more of a $160 level boot. Added to that, I found them to be incredibly durable, something that only increases their overall value. They are the not the best performing boot on the market, but they certainly are one of the best in their price range. Ensuring you are comfortable with the fit is obviously very important with these. If you have a chance to try a pair on first, it is highly recommended. But I did find them to be more accommodating than other Mercurial releases of the past. Outside of that, they are a quality, value for money, speed boot option! 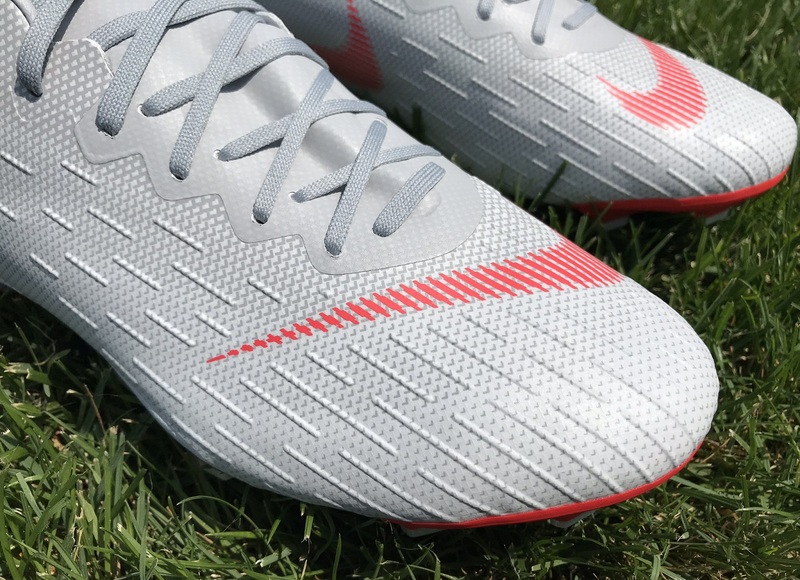 Highlight: The mid tier boot in the Mercurial Vapor series, designed to provide lightweight speed in an economical package. Would I Buy Them: If you are on the market for a speed style shoe, I’d highly recommend them as a back-up or practice boot. In the event you just can’t afford a top-tier release, these are again a boot that come with a lot of positives. Player Position: I see them as more of an attacking style players boot, or defenders who like to take advantage of moments when they can get in to the oppositions half. Tried them at the shop and they were not for me. Think of wearing an eggplant in your feet, they shape like a tube, so obviously, lots of gaps around the feet arch. When I walked, the area around upper midfoot creased in to create pressure points on my feet. Took them off quickly after 5 minutes. I wonder how they would last. Had 2 vapor xi (purple and blue NJR) they worn-out pretty quickly it's like 11 games and cracking are everywhere.. Eventually bought victory version and last longer than I expected. Yesterday, I bought the academy version with the MG studs because I want to be ensured the expensive version would last longer than XI. The academy fit my wide foot well and it's roomy than the victory. However it Doesn't have the snug feel as vapor / victory. I wonder if you could advise how long the elite and pro would last.